When Calgary Flames and Los Angeles Kings last met on March 19, Matthew Tkachuk earned himself a two-game suspension for elbowing Kings defenceman Drew Doughty. There was no penalty on the play during the game and Doughty called out Tkachuk’s reputation after his team’s 5-2 loss. "He's a pretty dirty player, that kid," Doughty told Fox Sports' Jon Rosen at the time. "To be a rookie and play like that is a little surprising. I don't know exactly what happened because I got hit in the head, but I thought he elbowed me. I can't tell you for sure, so I'm not going to say if I think anything should happen, but whatever it was, it hurt pretty bad, and it's going to hurt for a little bit." 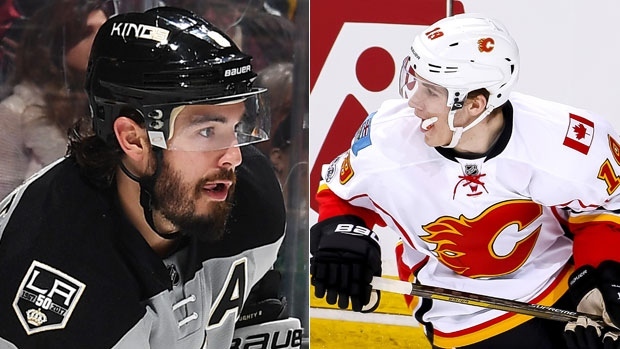 The two teams are set to meet for the first time since Doughty’s comments on Wednesday night, when the Flames can clinch a playoff berth with a win. Tkachuk furthered the storyline on Tuesday when he said he was surprised Doughty, a nine-year NHL veteran, aired his thoughts out to the media. “I expected more from him, honestly, than to go right to the media and start complaining after a loss,” Tkachuk told the Calgary Sun. “But he’s a good player. He’s a good enough player where he doesn’t have to worry about any of that stuff. He’s a skilled guy and everything like that, and he’s won a couple of Cups. The 19-year-old rookie insisted the comments by Doughty didn’t bother him, though. Flames head coach Glen Gulutzan noted Tuesday that Tkachuk will likely be a marked man by the Kings, who are fighting to stave off elimination from the playoff race. “We’ll talk to him. We know that there will be a little of a bull's-eye probably on Matty,” Gulutzan said, per the Sun. “And not in a malicious way. Just that, hey, they probably won’t like what happened and they’re going to play him a little extra hard and he’s going to have to be prepared for that. But we’ll be prepared too. We won’t let anything get out of hand. Tkachuk owns 13 goals and 46 points – good for sixth among rookies - this season. He has also racked up 98 penalty minutes on the year, tied for 10th in the NHL. He’s also picked up two fighting majors on the year, the last of the two coming on Dec. 16. Doughty has been in just one fight in his NHL career, which took place during the 2011-12 season.